Professor Dame Wendy Hall will be delivering a keynote on Wednesday. She will discuss recent developments in “Openness” with specific focus upon the opportunities offered by the convergence of Open Data, Open Research and Open Learning. Wendy will draw upon contemporary examples from the Web Observatory, Open Data Institute and the Web Science MOOC to highlight the aspects of openness that are now working well, and also those which are proving more challenging. Chris Phethean is demonstrating his work which is titled “Analysis Of Charities’ Communication Styles On Twitter” It comprises a novel piece of software for automatically analysing charitable organisations’ posts and classifying the results into specific communication styles. Please note that Ben Mawson’s talk advertised for Monday 22nd July has been postponed until 14th October. A full list of Digital Economy Autumn events will be available from this site shortly. Mary Ellen Zurko is a security architect and strategist at Cisco Systems. Her research interests include security standards and usable security, specialising in the socio-technical aspects of computer and information security. Zurko has an MS in computer science from the Massachusetts Institute of Technology. She is chair of the IW3C2, the steering committee for the International WWW Conference series, and is an active steering committee member and organiser of New Security Paradigms Workshop and the Symposium on Usable Privacy and Security. Meet the Open Data team! We’re putting on an open day for all members of the university to come and discover what we do and how open data can help. We’ve booked the Access Grid Room and the Coffee Room in Building 32 (EEE) and will be running a series of talks, workshops and general ‘get to know us’ sessions throughout the day. Talks from members of the University community on how open data has helped them. Tutorials from the Open Data Service – how to help us to help you. Demos of some of the cool stuff we’ve done and sneak peeks of what we’re currently working on. Hacking sessions for technical people who want to get their hands dirty. Free food and coffee, sponsored by the Digital Economy USRG! This is a free event, and will be running across the entire day, please feel free to drop in even if you can only spare 10 minutes. NOTE: If you have any data, no matter how trivial it may seem, please bring it along! We can read most types of database, spreadsheets and documents, and will have hackers on hand all day who will endeavor to make it into something that benefits you, and the wider university community. Really enjoyed last night’s Raspberry Pi Workshop at Southampton University, which was sponsored and organised by the Institution of Engineering and Technology, in collaboration with the Centre for Strategic Innovation and Dirk Gorissen, then part of Engineering and the Environment here. 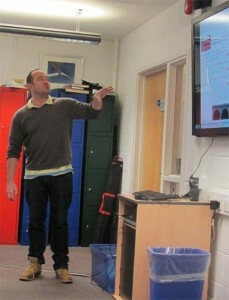 The session began with a demo from Simon Cox and an excellent introduction to parallel processing. 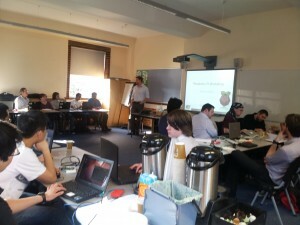 25 folks then got down to business, setting out the basics of getting a Pi up and running with Python and GPIO. While the deadlines for presenting have now passed, registrations from businesses, academics, policy makers and students who would like to attend the event are most welcome. Debate how the web is revolutionising society, and the event concludes with a final selection of papers. There will be contributions from people involved in the development of MOOCs from Edinburgh and the Open University (including Futurelearn) as well as the student perspective of what it is like to participate in a MOOC. On the theme of online learning, we have contributions from students on the Curriculum Innovation Module ‘Living and Working on the Web’ about their experience as “blended learning” students. For more details of the timetable and speakers, and to reserve your place, see Fiona Harvey’s CITE post. 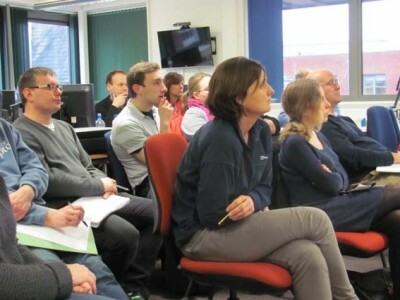 Graeme Earl, Alison Simmance, Fiona Harvey, Peter Wheeler and myself went down to Avenue Campus the other day to run the first in a series of interactive blogging workshops. We were demonstrating the new University blogging system and we included a number of examples of how and why academics and students should be blogging effectively. Thanks to Karen Woods for the photography! 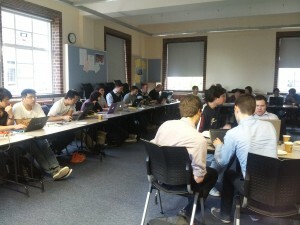 Random Hacks of Kindness was a delightful experience for the Digital Champions. Before the event we met twice to learn more about #RHoK, our tasks, and technologies that we were not familiar with, and that we were supposed to use during this social hacking weekend. Ivan (@IvanMelendezCh) was responsible for managing the Digital Champions and arranging the meet ups before the event, to let us know about the required tasks and technologies used during the weekend. He suggested that we make a Google account, so that we could use Google docs to share information about the essentials proposed by the organiser of #RhoKSoton, Dirk Gorissen(@elazungu). Google Hangouts is used for communicating with all the other #RHoK people all over the world. We practiced using it in case hackers needed help with Google hangouts and then we could be able to assist. Amir (@amir_arya) was the only person responsible for tweeting from the main account of #RHoKSoton, as well as his own account. Additionally, he made a really beautiful Instagram photo gallery during the two days of this event. Nikoletta Toumazatou(@speckidea), Nader Tibi(@ntibi04), and Evi Sopasi(@ESopasi) were responsible for taking photos, tweeting, and supporting people with the use of devices (yes, in a room full of hackers you might need support with technology). 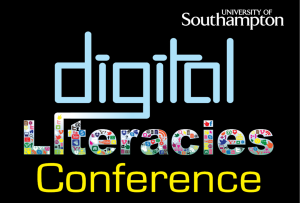 In general, this event could be considered as one of the most successful events aided by the Digital Champions. Our social media activity was highly regarded by the main organisers of this global movement. We discovered some areas of opportunity, for example if all the Digital Champions could gain video editing skills, our presence could become even more helpful. Here is Dirk’s summary of the event.